For anyone that has any amount of Eastern European heritage I’m fairly positive that it’s built into their DNA to love spaetzle… and being 50% Ukrainian I am certainly no exception! It’s not something that I make often, but every time I do my wife and I look at each other and she says “Why don’t you make this more often! ?” Then again it’s also built into her, DNA being 50% German. In fact it was her beloved grandmother that first turned me onto these tasty little dumplings over 20 years ago. So I made it the other night and it was a huge hit, even with the kids. Serves 2-3 as an entree, 4-6 as a side. You can make the batter by hand with a spoon or whisk, or with a stand mixer. My theory is that if God created stand mixers to make our lives easier, it would be wrong not to use them… haha. Combine the flour with 1/2tsp each of salt and black pepper. In a separate bowl beat the eggs and egg yolk, and then beat in the milk. Add the mixture to the dry ingredients and begin mixing on low using the paddle attachment. Once the wet and dry are well integrated increase the speed to medium and continue mixing until you have a smooth batter. Bring a pot of salted water to a boil. In small batches, pour the batter into a colander with large holes and push it through into the boiling water with a rubber spatula (or use a spaetzle press if you’re smart enough to have one, which I’m not). Boil the spaetzle until they float the top, approximately 1 minute, then use a slotted spoon to transfer them to a second colander to strain. Repeat until you’ve used all of your batter. Melt the butter in a large sauté pan at medium heat and add the garlic, cook until it starts to sweat, 2-3 minutes. Increase the heat to high, add the strained spaetzle and 1tsp each of salt and pepper. Sauté until the spaetzle very lightly browns, stirring regularly. Turn off the heat, toss in the thyme and parmesan, and plate it up. There you have it, the delicious eggy little pasta’ish dumplings that we all love… Serve them as a side or as the main dish! Tags: cooking, dumplings, food, german, parmesan, pasta, perfect pairings, perfect pairings at home, side dishes, sides, spaetzle. Bookmark the permalink. 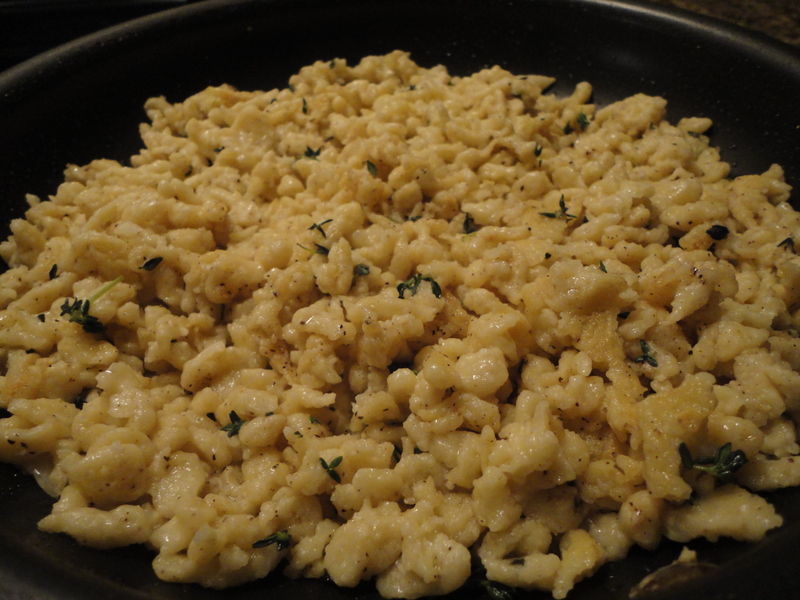 Spaetzle is a favorite of my husband (German background). I like the idea about pushing the dough through the colander. We flip them off the end of the spoon and put them in soup or broth. Thanks for the recipe. My pleasure Val. Just make sure you use a colander with larger holes. I have one from a double boiler whose holes are about 1/4″ thick.